Summer’s here – well sort of – today’s decidedly autumnal actually. Anyway, what can you do, it’s June, so for me that means it’s time to barbecue/braai as much as possible. Which also gives me the excuse to experiment with different salads. I made an impromptu version of this one earlier in the year with what I could find in the fridge. That’s one of the beauties of it, you can pretty much use whatever leftover vegetables you have. I take time and effort roasting them all, regularly checking their progress and turning them, as I like them to be that perfect slightly blackened colour with a little crispiness without being burnt. Cooking them slowly with attention ensures everything is bursting with flavour and makes the salad. Lay them in a single layer in the roasting tray and cook in batches if necessary. I dry fried the pine nuts, it brings out some of the delicious oils and enhances the flavour. But take care, they burn very easily and it’s not good to have to throw away the charred remains of this rather expensive commodity. 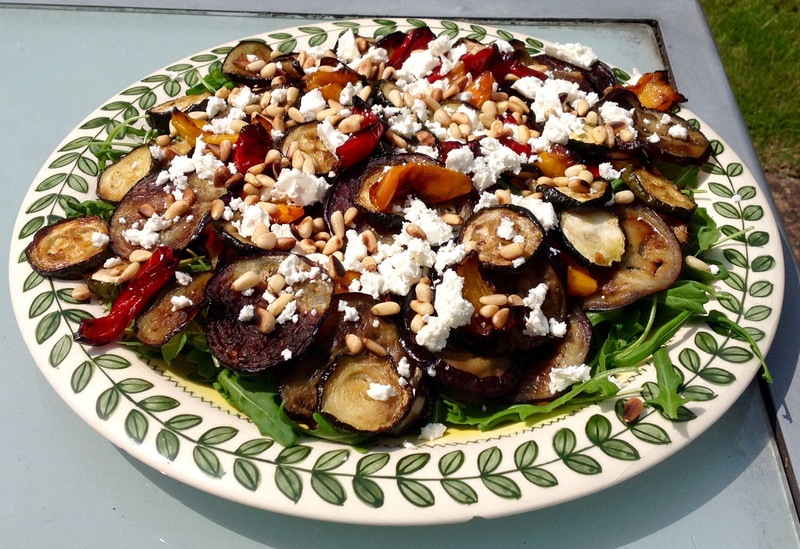 Do you have favourite salads that you like to make when you barbecue? I’m always looking for new ideas, so do get in touch and let me know what they are. Roast the aubergines, courgettes and peppers in the oven at 180C for about 30-40 minutes. Remove from the oven and place on kitchen roll to drain and cool. Make the dressing by mixing the olive oil, balsamic vinegar and honey. Dry fry the pine nuts in a pan over a medium heat for about 5 mins. Keep a close eye on them as they burn easily. Spread the rocket over a large platter. Layer the roast vegetables on top. Sprinkle with crumbled feta and the pine nuts. Pour the dressing over 10 minutes before serving. Love roast veg salad. Add some butternut, works really well. And of course the Gungai if braaing !! Enjoy summer !